The bird of paradise, a member of the banana plant family, is an attractive ornamental that grows in USDA climate zones as far north as zone 8. It forms clumps of dark green, strap-like leathery leaves, above which rise the unusual orange and purple flowers that resemble a tropical bird. Several types of fertilizer are effective in keeping this plant healthy and in helping it produce a large array of flowers. The University of Hawaii College of Tropical Agriculture recommends that bird of paradise plants receive 1 pound of a slow-release balanced fertilizer every three months to help the plant grow to its maximum potential and produce the flowers that give it its name. This university also suggests spreading a 3- to 4-inch layer of organic mulch around the plant's base to keep the soil moist and to provide a continuous supply of nutrients. You can use well-composted animal manures to fertilize bird of paradise plants, or you can purchase manure in bags at your nursery. Steer or chicken manure is strong stuff, so make manure “tea” by mixing 2 cups of this material with every gallon of water you need to water your plants. Be sure not to fertilize your bird of paradise plant when it is dry: it’s best to run a sprinkler or soaker hose for about 30 minutes before you water with your manure tea. Use 1 gallon of mixed manure tea for each plant every three months, according to the University of Hawaii, and be sure you don’t over fertilize this plant. The University of Florida recommends fertilizing bird of paradise plants with blood meal if you prefer to use an organic product for your plant. Blood meal comes from animal blood that is dried and powdered. It helps plants to develop strong, healthy foliage because of its high nitrogen content. The N-P-K ratio of blood meal is normally 12-0-0, according to Colorado State University. It’s best to use blood meal only in spring, when your bird of paradise plant is beginning its annual growth, because if you give it excessive nitrogen, the plant will produce lots of foliage, but fewer flowers. If you till in 5 to 10 pounds of powdered blood meal for every 100 square feet of garden area, the University of Colorado reports, the blood meal will remain active for one to four months. 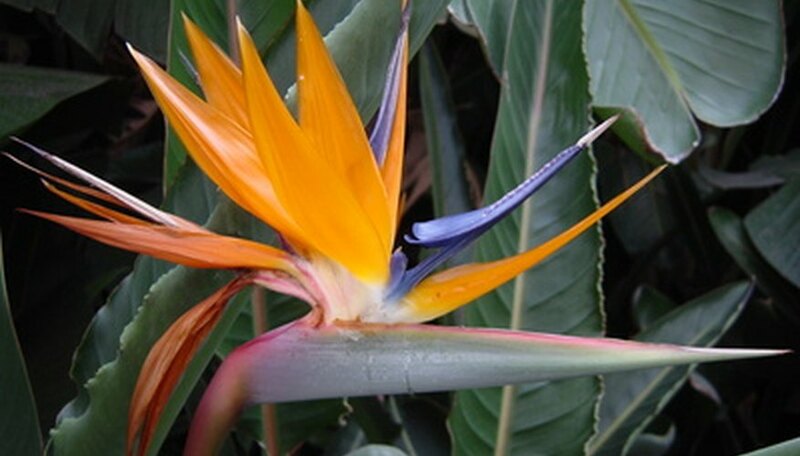 You can use commercially available granular landscape fertilizer on bird of paradise plants. When you use a granular fertilizer, scatter the recommended amount on the soil around your plant, according to label instructions. Be careful not to use too much of this type of product, especially if it has a high nitrogen content. Clemson University advises fertilizing every two weeks beginning in spring and then increasing the frequency to every week in summer, but then stop giving your plant fertilizer in fall and winter. For plants that are three years and older, the University of Florida suggests monthly feedings of low nitrogen fertilizer to promote flower production beginning in March and continuing until mid-summer. The National Gardening Association recommends controlled-release fertilizers as a remedy for the “feast or famine” effects of other types of fertilizer. Slow-release fertilizers can also benefit the environment, because they do not deliver a large amount of chemicals into the groundwater system all at once. Synthetic organics made from urea are often included in slow-release fertilizers, as well as natural organic materials, such as cottonseed meal, fish emulsion, soybean meal, manures and compost. The brand names of some controlled-release fertilizers include Osmocote and Nutricote. Apply these types of fertilizers around your bird of paradise plants once every three months, starting in March, and repeating your application in June and September. Will Blood Meal Dissolve in Water?